Have you ever been intrigued by the artistic design of a metro station? Have you stopped to watch a street dancer perform on a metro platform? A metro station can be more than a place where you impatiently wait for the next train to arrive. It has the potential to be more aesthetically pleasing, more interactive; an experience. Incorporating various art forms into the design and operation of metro systems gives each station unique character. Around the world, metro stations are transforming into art expositions, concert halls and museums to improve passengers’ experience and connect them to the city above ground, turning their mundane commutes into anything but ordinary. Cities around the world are exposing metro passengers to creativity and culture, transforming stations into microcosms of the city. Some stations create artistic scenes, while others embed city culture and history in station design. Famous for Ancient Chinese gardening, Suzhou, China created a number of garden scenes in its metro stations. These displays not only expose visitors to the city’s profound cultural heritage, but they also emanate a tranquil atmosphere in the busy metro station. Similarly, metro stations in Athens, Greece, strive to connect passengers to the city’s deep, historical culture by housing archaeological treasures. The Akropoli Station, which opened in 2000, has replicas of Parthenon friezes to greet passengers as they enter. 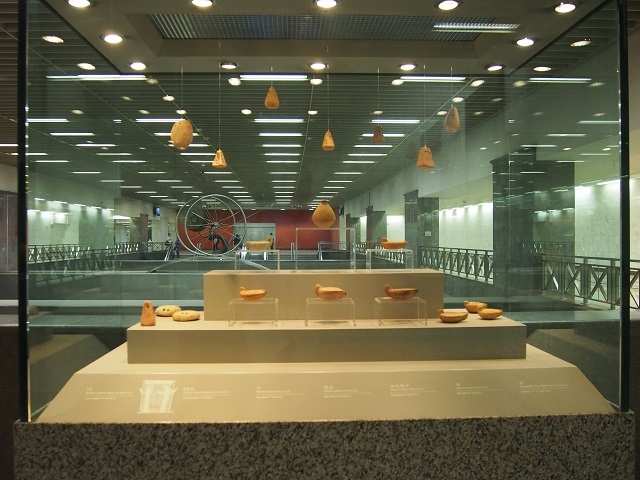 Similarly, in the Syntagma Station, impressive archaeological displays turn the upper concourse into a museum. Stations are not the only aspect of metro systems where art and culture transcend museum and canvass. Railcar exhibitions encourage local artists to unleash their talents and creativity. The well-known School of the Art Institute of Chicago (SAIC) launched a project in 2008 that transformed railcars into portable galleries. One of their projects turned a railcar into a “mobile garden,” with sod floors, hanging vines and various plants. While simply traveling in the car provides a unique experience, the artists intended to create a more interactive metro ride; passengers were encouraged to pick hot peppers from the plants and take them home. Decorated railcars are not only a unique outlet for artists, but they also stimulate future and increased ridership. In September 2013, the mobile garden attracted over 2,000 riders in a five-hour period. 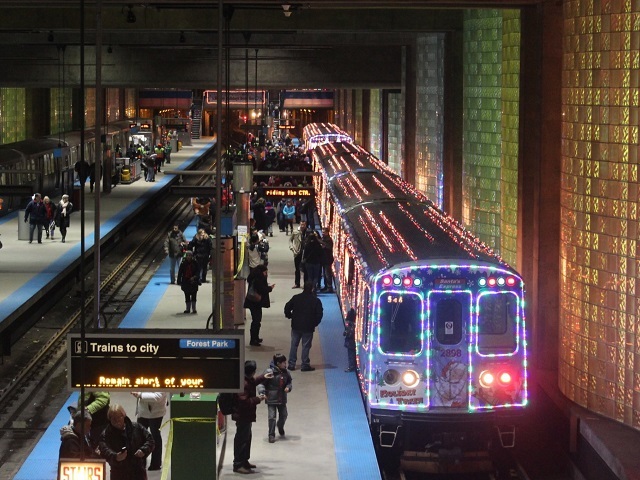 Additionally, each December, a six car, Chicago Transit Authority train transforms for the holiday season. Complete with thousands of twinkling lights and sleigh bells, the train attracts visitors from near and far. While Santa and his slay guide the train, elves wander the corridors, passing out candy canes and holiday cheer. 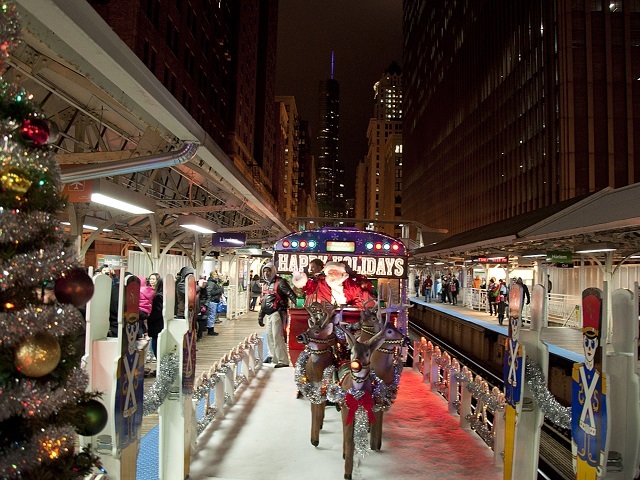 Throughout the month, the holiday train makes its way up and down each rail line, providing families from all over Chicago with the opportunity to ride and share in the holiday spirit. Transforming metro stations does not exclusively fall on the shoulders of architects and interior designers. As public places, metro stations also provide platforms for street artists to showcase their talents. Paris metro stations are known to attract street artists to exhibit their work. Singers, instrumentalists, dancers and graffiti artists can all find a place in metro life and interact with a broad range of audiences. The video below shows how musicians and dancers collaborate with each other and perform for passengers. Although the quality, price and convenience of transport services are important considerations for choosing mode of transit, the arts play a complementary role in enhancing passenger experience. Diversified forms of art make metro stations and railcars attractive and culturally-enriching places. The next time you take the metro, you may step into a work of art.